The happiest of Fridays to you! Today we’re kicking off another month of the Power & Spark Challenge at Power Poppy. 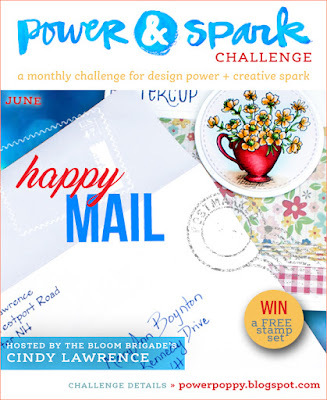 This month Cindy is our hostess and she’s bringing us The Happy Mail Challenge! How many times have you created a card only to have it sit in a basket waiting for that perfect occasion? This time, let’s flip that around and create a card with someone in mind and then, slap a stamp on that baby and put it in the mail! Keep in mind, we want this to be a card “just because.” Sure special occasions are important, but we want this one to be about simply sharing the love – not for birthdays or graduations or anniversaries—a “just because you care” kind of card for someone you’ve had on your mind. The challenge runs through June 30th at 8PM EST for a chance at a Power Poppy stamp set of your choice. My card today shows off the hen and chicks image from Power Poppy’s Sassy Succulents set. I stamped the main image onto watercolour paper in green and then used my Inktense pencils to watercolour the image in some vibrant greens adding in some fuchsia pink for contrast. On the background layer I embossed all of the hen and chicks images onto a 4 1/4 x 5 1/2 inch sheet of watercolour paper and also coloured it up with Inktense pencils. After it was all dry I took a stitched rectangle die, using the largest die, cut out a tiny frame from the watercolor paper, flipped it around 180 degrees and attached it back to the card forming a frame. Then it’s just a little satin ribbon and some sequins. The sentiment is perfect for a “Happy Mail” card. I think we all need to hear we’re special sometimes! This is going to a friend I know for know reason at all, just to tell her that I think she’s great. Here’s some more “just because” inspiration from the Bloom Brigade today. We hope you jump in on the challenge this month. It’s a win win for everyone! You could win a Power Poppy set and someone special in your life is encouraged! Want some other happy news before you go? Today, Power Poppy is hosting a coloring free for all over at Rhea’s Passionate Paper Crafters & Friends. 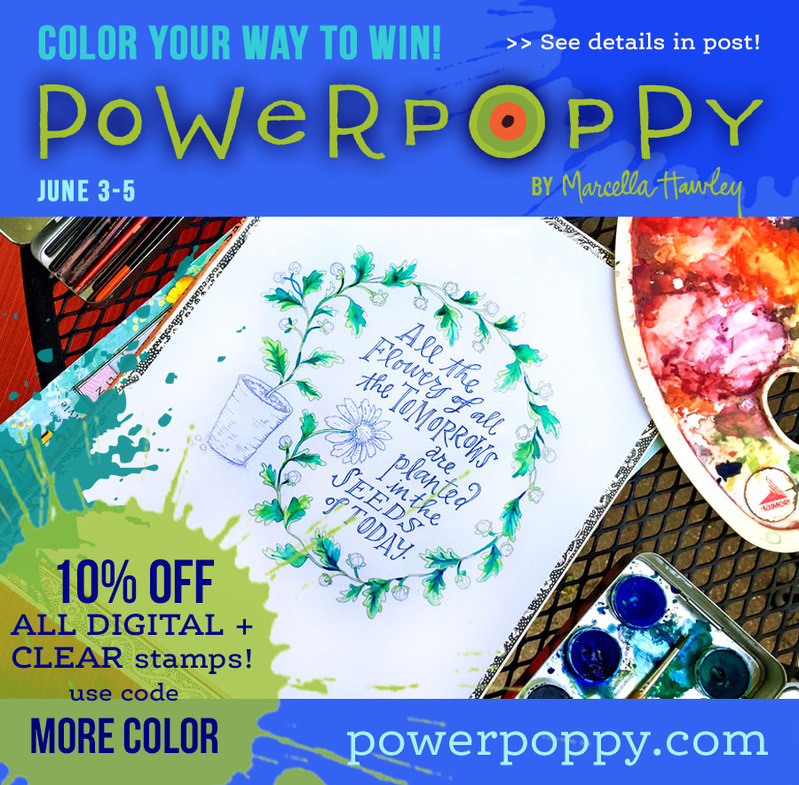 You just have to color up a Power Poppy image to be in the running for a $25 gift card from the Power Poppy Shop. And just in time for all this fun .... all clear & digital stamp Power Poppy sets will be 10% off you use the code MORECOLOR at the checkout!!! For more info on all this great news see the Power Poppy Blog! Wow! Look at this watercolor wonder! You're having so much fun with your Inktense Pencils. I love the idea of this challenge. I like to make 'em and mail 'em. Have sent two out this week, but can think of many more little reasons to send cards, even just to say "I enjoyed our visit". 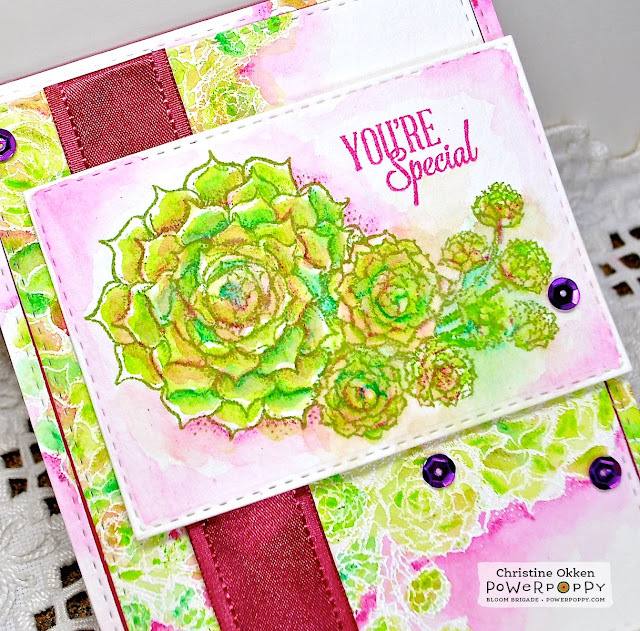 Love seeing these bright and cheerful succulents today, Christine! Your card shines Christine. I just love the effect from your creative magic. Wow Christine!! Your creativity never ceases to amaze me!! You're always thinking out of the box with amazing results!! Lovin' all the pinks and greens in this beauty!! Oh, Christine! WOW is right! My jaw dropped at the sight of this beauty, and I love how you've achieved this look and the great way you've "framed" it! And the satin ribbon is perfect along with the sequins! Amazing colors and so the perfect set for it! Yes, this month's challenge is one that I so need to do. Beautifully done, and thanks for the inspiration as always - you amazingly clever and creative gal!! Big hugs! 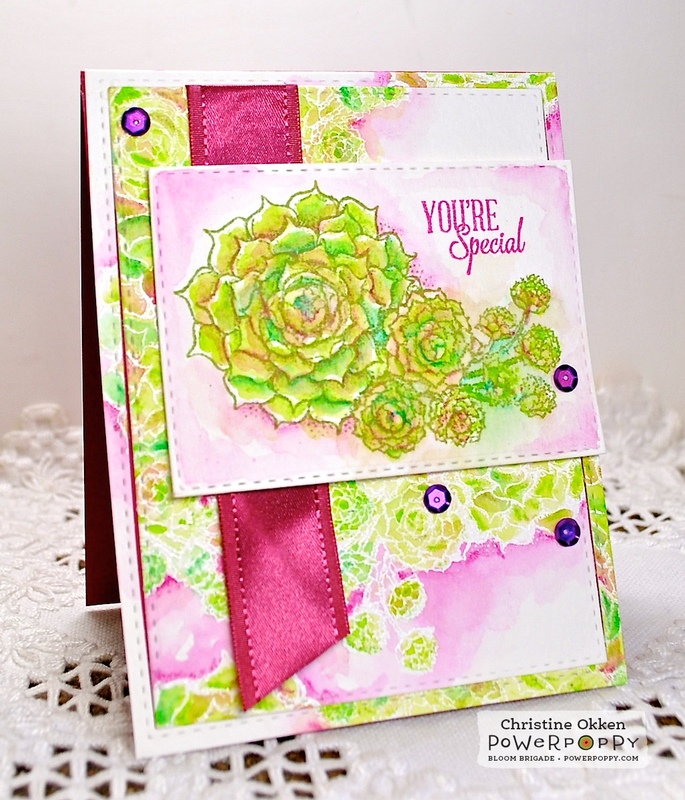 What a pretty way to use that succulent stamp! It is an eye popping card, very fun, TFS! Your colors are blended beautifully Christine. I like the hints of darker purple in the leaves. Beautiful card.